The rapid changes of our time lead to conflicts between cultural traditions and new ways of life. Career advancers spend more time in the office, they often go on business trips, they have less time for themselves and their families. The lack of time changes everything from eating habits to family orientation, the way of communicating and consumer behavior. And in many international markets, foreign influences, industrialization or massive urbanization are turning even ancient traditions upside down. Individualization is increasing and consumer behavior is spreading, particularly in the middle classes around the globe, which is intended to showcase the newly acquired status. There can be no question: culture is and remains a decisive factor for consumer behavior and thus also for brand positioning. Niklas Schaffmeister (Managing Partner Globeone) and Florian Haller (CEO Serviceplan Group) therefore explain why an intensive examination of the culture and cultural values in the target markets is indispensable for successful brand development or repositioning. Read more in detail in our new Springer publication “Successful brand development in the major emerging markets”, written in German, by Niklas Schaffmeister (Managing Partner Globeone) and Florian Haller (CEO Serviceplan Group). The definitions for the term culture have become as diverse as the cultures of this world. Things may become clearer if the term culture is separated from cultural values: Culture then refers to the totality of human behavior in a society, while cultural values refer to a series of beliefs about certain behaviors that are considered particularly desirable in a society. In marketing, the conviction has therefore developed that cultural values are a powerful factor that has a decisive influence on the motives of consumers. This applies to their lifestyle as well as their product selection. Foreign brands that want to address these different cultural preferences must therefore familiarize themselves well with the cultural environment in the local target market. In view of the diversity of values and moral concepts, however, this is easier said than done – brand managers are often faced with the challenge of identifying the consumer-relevant value dimensions for brand development. In such cases, so-called catalogues of values have proven to be a helpful instrument. Sociologist Shalom Schwartz, for example, has developed a catalogue of values that identifies seven important cultural value dimensions on the basis of data from 73 countries. On the basis of these dimensions, it is not only possible to differentiate between the essence of cultures worldwide, but also to record individual, culturally specific and consumer-relevant value dimensions. 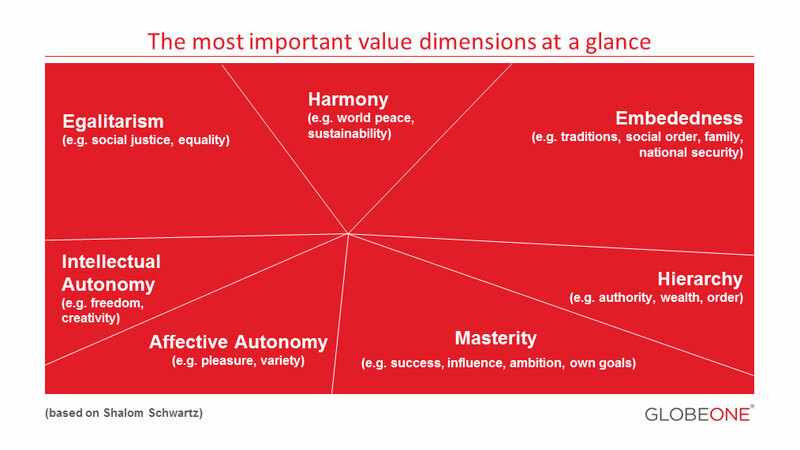 It quickly becomes apparent that there are enormous differences along these value dimensions, for example between European countries and the major emerging markets such as China and India. While in China and India hierarchical values are given high priority (e.g. in the form of the caste system), in Europe the focus is on egalitarian values and intellectual autonomy. Put simply: people want to enjoy their freedom, work creatively and realize their full potentials. Besides the family, society, religion and educational institutions, the mass media – not least digital and social media – have developed into important carriers and mediators of cultural values in the post-industrial age. However, it has been shown time and again that advertising also has a great influence on the representation and communication of cultural values. Advertising is based on linguistically powerful images and metaphors. These, in turn, are strongly influenced by cultural values which have an influence on culture, insofar as they are received by a broad circle. The “similarity acceptance hypothesis” is regarded as a rough compass for successful brand communication in the local target market. Its message: The more similar the values communicated by a certain brand are to the values of a certain social class, the higher the probability that the brand is attractive for this grouping. Conclusion: culture has a strong influence on consumption. In marketing you have to find the most effective levers to use this influence. This requires a profound knowledge of local cultural values.